Growing pear trees can be a rewarding experience for the home gardener, but before you begin, there are a few things you need to know about how to plant. Read on to learn what those are. Prior to planting pears in the home garden, pear tree size should be considered first. A full size tree can grow to 40 feet. Depending on the size of your lot, you may want to consider a dwarf or semi-dwarf variety. While Bartlett is probably the most common home grown pear, there are several varieties available. Check with a trusted nursery in your area to discover which variety grows best. While growing pear trees from seed is possible, you’ll get faster crop results by buying a young tree. 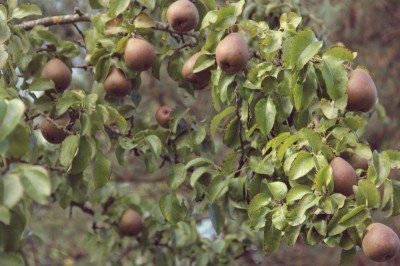 When planting pears, a smaller well formed tree will give you better results that a tall spindly one. Now that you’ve chosen your tree, the next step is planting. Pears require full sun. Be sure to choose a spot that will ensure at least six to eight hours of sun, not only for your sapling but for your full grown pear. Tree care will be easier if you plan ahead. Dig your hole wide and deep, mixing mix plenty of compost into the soil. Remove the tree from its container, including the burlap, and set it in the hole to the same depth it was in its container. Gently spread the roots and refill the hole with the amended soil. Water well and continue to water regularly — once or twice a week — until the roots are well established. Knowing how to plant a pear tree isn’t quite enough. An important part of pear tree care is pruning, and the first pruning should occur as soon as your tree is planted. Leave a central leader and choose three to five branches with outward rather than upward growth and prune out the rest. Trim off the ends of the remaining branches to encourage growth. There are many books and articles written about pruning, but for the home gardener, pruning care of pear trees can be limited to removing crossed branches and fast sprouting upward growth. Your pear tree will bear fruit in three to five years. Compared to other fruits, care of pear trees is simple and straightforward. They don’t suffer from as many diseases or insect problems, thus are easier on the grower. Care of pear trees begins right after planting. Pears should be staked with a sturdy post driven into the ground to help the tree grow straight and withstand wind damage. Mulch at a depth of 2-3 inches in a three foot circle around your tree to prevent weed competition for nutrients and water. Unless your soil is extremely poor, fertilizing once a year should be enough for your pear tree. Care, in fact, must be taken to avoid over fertilization which produces a lovely tree, but no fruit. 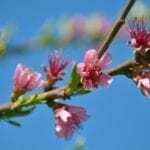 For the home garden with only one or two trees, fruit tree fertilizer spikes are perfect for the job. They’re easy to use and provide a slow release of fertilizer that will be enough for the year. Some gardeners will insist that insecticides and dormant oil spray just before buds blossom are essential to the proper care of pears trees. I’m not one of them, though I’m not necessarily against their use. For growing pear trees, however, I’d wait and see if they were necessary before instituting their use. As stated earlier, pears have fewer insect problems than other fruits. 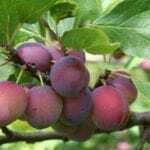 One of the reasons for this is their flower nectar, which isn’t as attractive to insects as other fruits; and as bees are the main pollinators of your pear tree, care should be taken not to drive them away or, worse, kill them. If your first crop, which is usually small and often inedible, is badly damaged, then you’ll have plenty of time to re-evaluate before the next season. Why work harder or spend more money than you have to? See what nature has to offer first. Remember, folks have been growing pear trees in their backyard gardens for a long, long time. Grandma loved them for their delicious fruit and Grandpa loved them because, once established, they were very little work!